Colored diamonds have become one of the most important long-term collectibles markets over the last decade. Since the 1970’s fancy colored diamonds have grown by 100% every six to eight years, with some color categories, such as blue, purple and pink diamonds, growing at an even faster pace. During times of economic turmoil, colored diamonds have proven to hold their relative value and in growing economies have seen strong increases in purchasing from the wealthy classes around the globe at the auction, retail and dealer level. Colored diamonds have become the foremost wealth preservation vehicle due to the fact that they are extremely rare and that buyers are acquiring for the long term and working from a strong capital base. Colored diamonds are difficult to replace and thus owners, whether it’s the dealers, retailers, or private collectors and investors, would rather sell their more readily replaceable holdings before their colored diamonds. Furthermore, most of the buyers in this market are wealthy individuals. They will be less affected by economic downturns, so dealers asking prices tent o hold up well during economic downturns. The owners are working from a strong capital base and generally have alternative means of raising capital rather than discounting their diamonds. Dealer asking prices have always maintained solid relative value. The data is based on dealer asking prices and auction sales for Fancy Intense Pink diamonds from eye clean to internally flawless, all well made stones. The prices are just guides and should not be construed as specific pricing points. Specific diamonds will sell for premiums or discounts depending on the agreement between the buyer and seller. Like real estate, rare coins and art work, colored diamonds take time to sell, so the patience required to liquidate stones is another important consideration when looking at the price stability of rare colored diamonds. Furthermore, colored diamonds have higher margins than many other assets, so it behooves the owner to hold them over the long-term to ensure value is maintained over time. 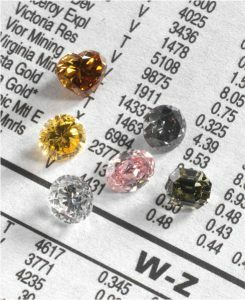 The colored diamond market does not have options, futures or short selling, nor is it a market heavily leveraged, which can lead to additional volatility in any market. As a result, colored diamonds have shown very good stability and consistency over the long-term and have been considered an important collectible holding for long-term buyers. Rarity — Because of the rarity, scarcity and the increase in buying for valuable colored diamonds, prices should continue to rise for the next decade. 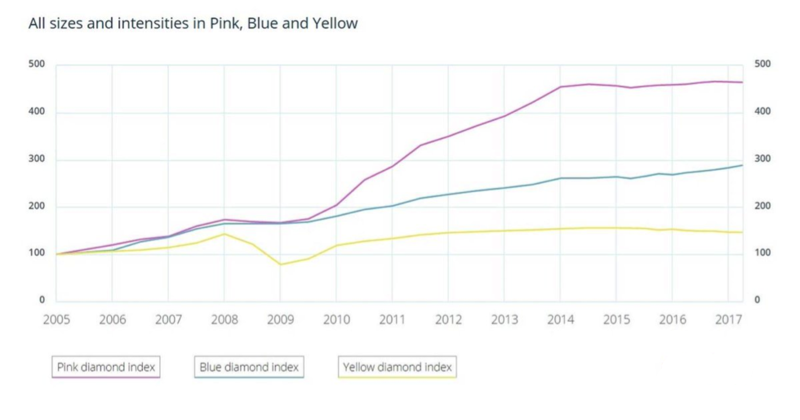 It is important to understand that colored diamonds are still fairly new for a lot of diamond buyers, so the potential for growing sales is positive while the supply stream is finite. Portability — Colored diamonds are considered the most concentrated form of wealth in the world. To see such rarity and value in such a small space commanding in some cases millions of dollars at the auctions is very attractive for luxury buyers, who don’t have to be concerned with the costs of storage and insurance of large items like cars or paintings. Legacy Planning — Estate Jewelry has become a growing market over the last twenty years and rare colored diamond sales at the retail, auction and dealer level are becoming an important component of that. Families have passed down diamonds and jewelry for generations.